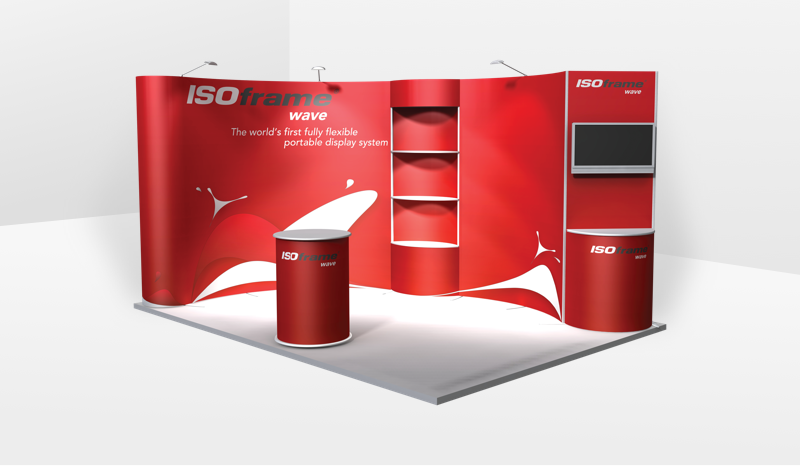 ISOframe Custom Exhibition Stands are designed, manufactured and professionally installed to your exact specifications. They provide a blank canvas for creativity and innovation; from initial ideas to the small details that make a big difference, we’ll work with you to meet your exact exhibiting requirements from design to installation. The modular ISOframe exhibition framework also gives you the flexibility to reconfigure your stand to suit different spaces across your programme of exhibitions, events and trade shows. Download our Custom Brochure here. We take great pride in offering an exhibition stand that is designed, manufactured and professionally installed to your exact specifications, all with minimal hassle. We understand that exhibiting might not be a regular occurrence for some. That’s why we offer an inspiring range of beautifully finished exhibition stand rental packages for you to choose from. 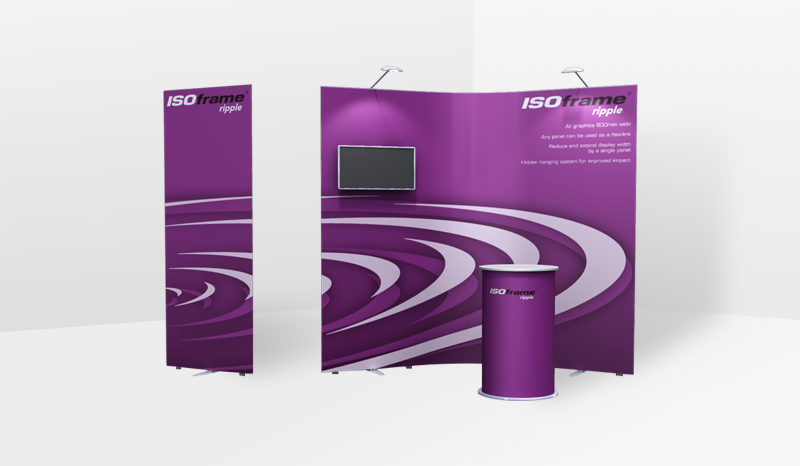 ISOframe Modular Exhibition Stands are lightweight, portable, easy to put together and offer total flexibility. 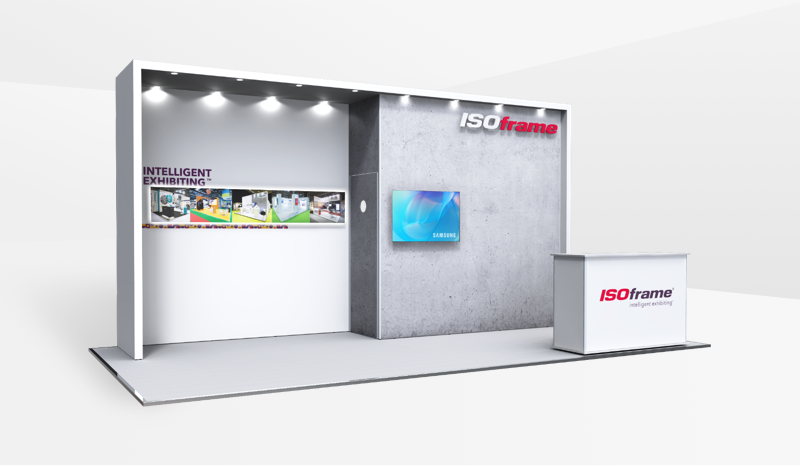 The ISOframe framework means that the stands can be reconfigured to suit different floor space sizes, and you can have interchangeable graphics so your stand’s messaging can be easily adapted to your exhibition and audience. Transportation is made simple with a compact storage case and with no tools required to build the frames, ISOframe Modular Exhibition Stands lead the way on speed of build and versatility. Download our Self-Build Brochure here. 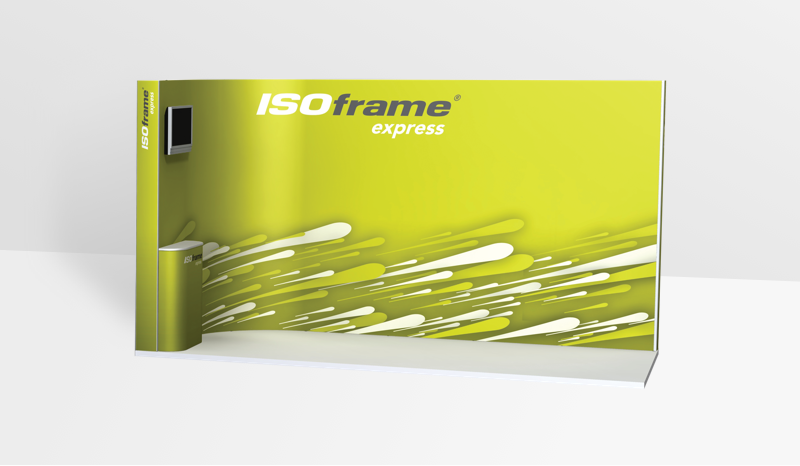 ISOframe Wave is a flexible, bendable, portable, self-build exhibition system, perfect for regular self-build exhibitors who need the flexibility to be able to adapt their stand to different sized venue spaces. With its tool-less assembly, the self-build ISOframe Lumen system is perfect for creating large, seamless, high impact exhibition stands and light boxes. Easy to transport fabric graphics makes it perfect for idea for shell schemes or free-standing installations. Lightweight and versatile ISOframe Portable Display Stands are self-build exhibition stands that are easy to assemble and transport. ISOframe Portable Display Stands offer some of the most versatile and cost effective display options available; we offer stands in a wide range of sizes that are simple to assemble, disassemble and transport. We offer both fixed and flexi options, all with interchangeable graphics so your stand’s messaging can be easily adapted to your exhibition and audience. Transportation is made simple with a compact storage case and with no tools required to build the frames. Multiple ISOframe Ripple banners can be linked together using flexible, bendable linking graphics, meaning you can adjust the shape and size of your display to suit your venue. Making the most of our simple and easy-to-use magnetic construction, the ISOframe Express Pop-up is a quick-to-assemble and easy to transport exhibition stand.